Miles Kevin and his colleague Caroline Godwin live and work in the heart of Totnes. Miles has run Chartsedge estate agent for many years, and Caroline joined him in the office when he moved his head office to Totnes in August this year. 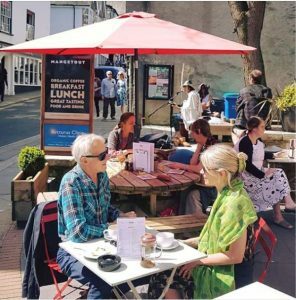 They often have the pleasure of eating out in the town and thought they would list their top 10 favourite Totnes restaurants and eateries. There is such a wide choice now and although they own up to not being Michelin Star reviewers, they hope this list will be a fun and honest help for others living or visiting the town, to decide which restaurant will suit them best, and have a fantastic meal. 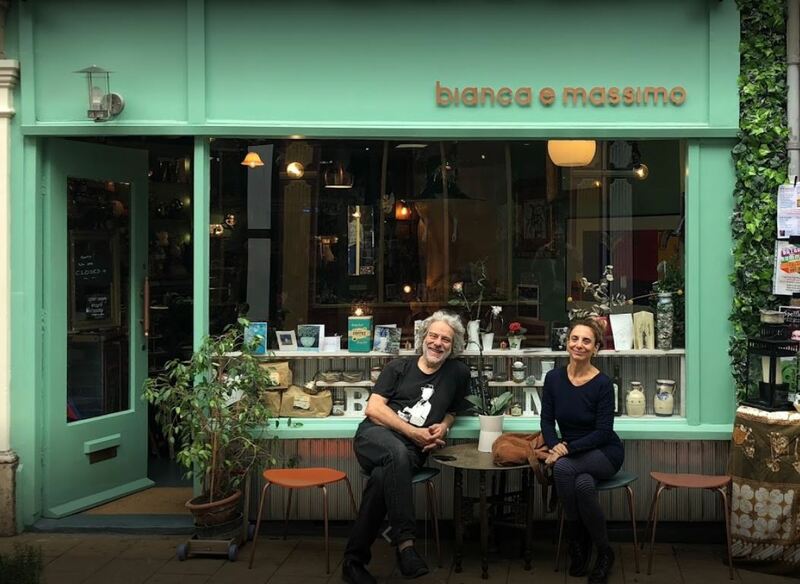 Bianca e Massimo This is a newly opened restaurant at the top of Totnes and serves organic vegetarian dishes. Miles took his wife Nicki here on their wedding anniversary and had the most fantastic meal. Although Miles is a confirmed carnivore he was charmed by this small intimate restaurant and the way you ordered food. Bianca comes to your table and asks what Italian dishes you like and then prepares a dish that you want. A must, but book as there are very limited covers. The Cott Inn A huge favourite of locals this family run thatched pub which has had a licence since 1320, is in Dartington village. In winter the roaring fire and a warm welcome is lovely after a long walk with the dogs and Sunday Lunch is epic. In the summer the sun drenched beer garden has its own kitchen serving lunch and dinner for alfresco dining. The landlords Mark and Mel are very welcoming and run a tight ship with great service and friendly staff. You must book for Sunday lunch. Pie Street This is exactly what it says on the label! 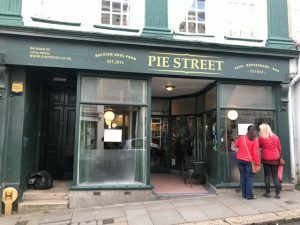 But until you’ve tasted one of their pies you will not appreciate how good a humble pie can be and what a very enjoyable ‘home from home’ experience a meal here is. Bill, one of the joint owners who is ever present, oversees everything with a big smile and is the perfect host, and in addition to being a popular haunt for dining out there is also a monthly quiz night which is well attended and very competitive – great fun but not for the faint hearted! Café Mumbai This is Miles and Nicki’s go-to curry house for takeaways, and very popular with locals for an evening out. Great choice and always freshly cooked, it is run by a local family who are charming with the wife front of house and the husband, the chef, and the friendly waiting staff are mostly local youngsters . Always book at the weekends and Nicki swears by the King Prawn Rogan Josh. Not actually a restaurant it is in fact a wood burning stove in the back of a van. These are very familiar to residents of Italy and the pizzas are just as good. Can be found in Dartington on a Monday and Totnes market square on a Friday evening. Check their website for other locations or book them for a private party. Really thin bases and great toppings. 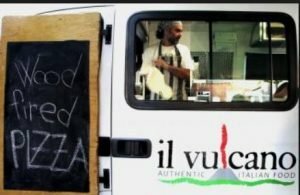 Try the Vulcano if you like it spicy! Ben’s Tapas A relative newcomer to Totnes, Ben’s Tapas is a lovely place to meet whether for a glass of well sourced wine (in very nice glasses!) or for some very tasty tapas. Filling a much needed gap in the market it means you can have a lovely spontaneous lunch or evening out, not spend a fortune and yet also ensure that you don’t return home having had just a meal of wine and crisps! Run by Harry Watson, (son of Ben formerly Riverford Farm shops and now Ben’s Farm Shops) one can rely on well sourced ingredients and know that you are benefitting from their years of experience and a very ethical outlook. Caroline swears by the Halloumi fries and lots of wine. Mangetout Café/Restaurant A popular coffee shop with locals and also providing tasty cakes and healthy lunches together with occasional music and poetry evenings. Run by a lovely team this unpretentious café has a cosy interior, small rear courtyard garden and also a large area of ‘on street seating’ from which to watch the world go by. Seeds 2 If you want to have a healthy vegetarian meal in relaxed atmosphere this is the place for you. Grab a plate and help yourself to some amazing homemade dishes served with fantastic bread from their bakers across the road. Great for having a quick meal on market day and now open in the evenings on weekends you can also get take out if you are bored with the usual sandwiches for lunch. Nicki’s favourite on a Friday so she feels healthy before a night out. Halls Butchers Ok it is not a restaurant but on a Friday the team at Chartsedge go over the road to Halls and get some Scotch Eggs for lunch. Hand made on the premises we think these are the best in Devon. 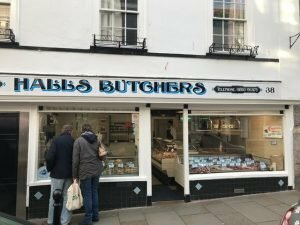 Their choice of meat, poultry, and homemade quiches and cottage pies are also excellent and advice on the best way to cook them is easily given as well as some great banter. Be wary of queues on Saturday morning and at Christmas. 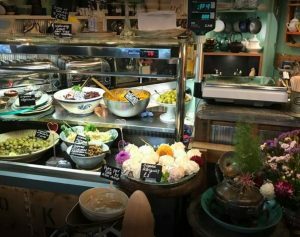 This rounds up our Totnes restaurant guide for now… We are sure to be eating out a lot more in Totnes, and sampling even more of the Totnes eateries. Let us know your favourites!